The end of 2017 has seen a flurry of activity as both the House of Representatives and the United States Senate passed tax reform Bills. Both Bills have been promoted as providing tax relief and simplification to individuals, small business and corporations. 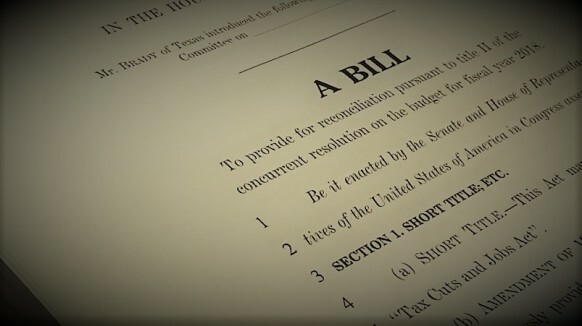 The House of Representative’s Bill entitled The Tax Cuts and Jobs Act was passed on November 16th while the US Senate’s Bill, which survived a vote of 51 to 49, passed on December 2nd. The two Bills have been combined into one comprehensive tax plan for the President to sign and turn into law. There are several nuances to these Bills, and making a blanket analysis would prove difficult and inaccurate. In addition, a sizable percentage of the new Bill focuses on providing relief for corporations and pass though entities; however, that component of the Bill falls outside the scope of this article. 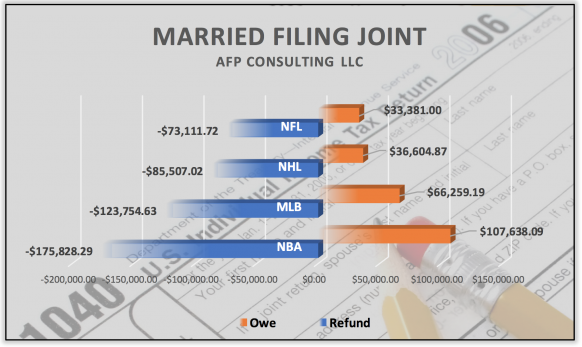 This article instead attempts to provide a fair analysis of both Bills and what the potential tax consequences will be for professional athletes. Here are a few highlights from the new tax Bill to better understand the potential changes and their effect. One interesting aspect of the new legislation is that it seem to hit single taxpayers harder than the current tax law. Once income exceeds $2,500,000, the difference between single and married filing jointly is a ratio of $2.32 per $1 higher than that of the current tax code. The increased standard deduction goes hand in hand with the next section’s change, the limitation of certain itemized deductions, the loss of the personal exemption and business-related deductions. The thought is that increasing the standard deduction would make up for the loss of deductions and exemptions that are being eliminated. Limiting itemized deductions would effectively maintain the integrity of the now lower tax rates at each tax bracket, closing what many consider a tax loophole. House Bill limits the mortgage interest deduction debt to only a primary residence and for up to $500,000 in debt, while the Senate Bill had proposed to eliminate the deduction until 2025. Final Conference Agreement between the two Bills compromised to allow the deduction of mortgage interest on a primary residence on up to $1,000,000 ($500,000 single) debt for current property and $750,000 ($375,000 single) for property put in place after December 15, 2017. This provision would expire and return to the current law after the 2025 tax year. The Final Conference Agreement lowers the current threshold to deduct medical expenses from the current 10% of your Adjusted Gross Income (AGI) to 7.5% until January 1, 2019. Both the House and Senate Bills eliminated State and City income tax along with property taxes, however, the final Conference Agreement allows up to $10,000 of these taxes to be deducted. In those instances where there is no state tax paid a general deduction for sales tax may be taken. As with the limitation on home mortgage this provision would also expire and return to current law after the 2025 tax year. For professional athletes this is a substantial loss. Professional athletes play in multiple states and pay both resident and non-resident state tax, often referred to as a ‘jock tax’ in each state and city. Athletes who reside and play in states with high tax rates, for example California, New York and Minnesota, pay a large amount in resident state tax. For example, a player playing for the Los Angeles Lakers earning the NBA’s average salary of $6,390,211 will pay $846,928 in jock tax over the 2017-18 season. Under the current tax law, that amount would be itemized and used as a deduction against his federal income and thus lowering his federal tax. Since each team plays in a different state and their schedules are all different, each team’s players will be subject to a different amount of tax. I.R.C. Sec. 162 entitles athletes to deduct trade or business expenses if they are ordinary and necessary to carry out the business of playing professional sports. The IRS defines “ordinary” and “necessary” in Publication 334 Chapter 8: “ordinary” means “common and accepted” while “necessary” means “helpful and appropriate.” It is important to note that, “an expense does not have to be indispensable to be considered necessary.” For professional athletes, these itemized deductions add up to a substantial amount and the loss of these deductions will negatively affect them. In 2011, Lamar Odom then with the Los Angeles Lakers, successfully defended a $178,337 deduction for training expenses and athletes at the highest level may exceed $500,000 for agent fees alone. For athletes who have income from endorsements or outside sources that can be claimed as self-employment income, they will still be able to use these expenses as a deduction to lower the income claimed on their Schedule C.
Although deductions will not be allowed on employment income in 2018, the provision does not apply for taxable years after 2025. There is no simple answer as to how the new tax law will affect individual professional athletes, as everyone’s situation is unique. Below I have run projections using the average league salary for each of the four US based leagues to show the range of results with the new tax legislation. Each of the projections used the leagues average salary for the 2016-2017 season (Sporting Intelligence). Teams in states with no tax will benefit the greatest from the new lower rates. 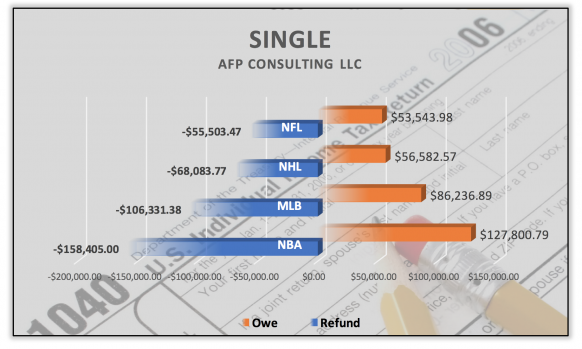 The benefits ranging from a high of $175,828.29 in the NBA (2.75% savings on $6,390,211) to a low of $73,11.72 in the NFL (3% savings on $2,439,734). After analyzing each of the teams in their respective league, the NBA players were found to have the greatest monetary advantage, largely due to having the highest average salary of $6,390,211. Players on the six teams who play in states with no state tax (Mavericks, Rockets, Spurs, Heat, Magic and Grizzles) will benefit $175,828.29 in tax savings. In contrast, players on the four California based teams, due to the loss in deductions, will pay substantially more in tax with the Sacramento Kings paying the greatest amount ($107,638.09) in additional tax. The chart below expands on the eight NBA teams whose players will end up paying more in federal tax under the new legislation using the criteria listed above. Single taxpayers are hit harder than their married counterparts. Using the same criteria as above, the average tax savings for these individuals dips, while those who owe, must pay more. As the graph below indicates, the wealthy receive the greatest monetary share of the tax break. Individuals earning $50,000 will receive a tax savings of $1,916 compared to those individuals at $30,000,000 who will receive an average tax savings of $435,980. Individuals playing on teams that aren’t subject to substantial amounts of state income tax will receive a tax savings of $789,682.80. However, every income level receives a 2.55% to 5.96% percentage tax break, with the highest percentage change at $250,000. Although, married couples under $1,000,000 receive the largest percentage tax breaks, when taking into consideration the loss of itemized tax deductions, their rate falls to under 3% at all levels other than $50,000 which remains the highest of all levels at 3.83%. As has been the theme, those individuals who will file as single don’t receive as great a benefit as their married counterparts. Although the extremes still benefit, it’s the income levels at $250,000 to $1,000,000 that end up breaking even or in some cases paying more under this tax plan. Individuals playing in California, New York, Minnesota, Oregon and New Jersey will be the most adversely effected with the loss of the state tax deduction. This loss causes any potential tax savings generated by the lower tax rates to be erased. Individuals playing in the above listed states plus Ohio, Wisconsin and the District of Columbia will be negatively affected by the loss of deductions for state and business-related expenses. Individuals playing in Florida, Texas, Las Vegas, Tennessee, Washington, Indiana, Louisiana, Arizona, Illinois, Massachusetts and Utah will benefit the most form this new tax plan since they play in State’s with no or low-income tax. Many of the changes in the tax plan will revert to the original tax law at the end of 2025, so good or bad, for many athletes these changes could be in place for their entire career.